The New York state Attorney General’s office approved an offering plan for Macklowe Properties’ condominium-and-retail development at 200 East 59th Street with a projected sellout of $264.1 million. The 35-story tower will feature 68 units averaging around $4 million. The property will be divided between 99,848 square feet of residential space and more than 18,000 square feet of retail space. According to a source, the offering plan does not include the retail portion and the three penthouse floors. Macklowe TRData LogoTINY is seeking $40 million from EB5 investors for the project. 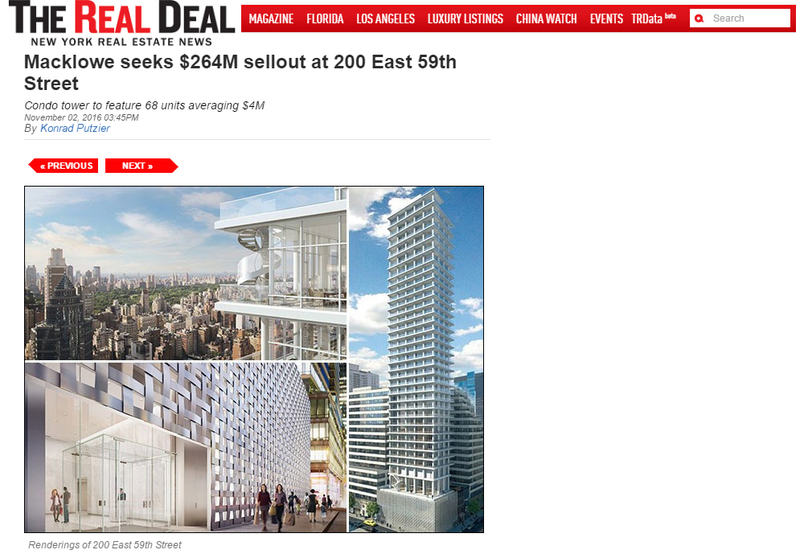 Advertising materials on an EB-5 broker’s website claim that the project will cost $278 million.